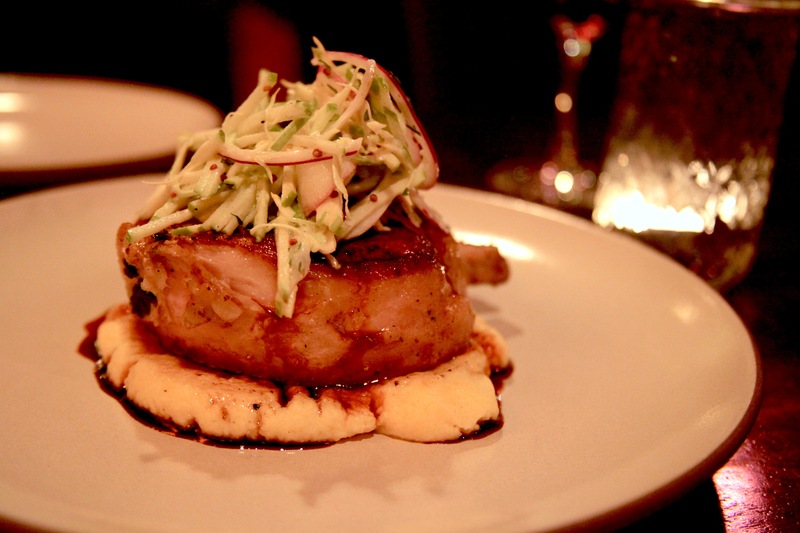 Pork chop with apple slaw and creamy polenta. Warren’s Blackboard blackboard is updated a couple times a week based on customer’s wishes. With your bill, you’re handed a feedback card reminiscent of something you’d see at a family restaurant chain: “How would you rate our service? What dishes were your favorite? Is there anything you would change about your dining experience?” The difference from say, Red Robin, is that Warren’s Blackboard listens. So far, because of the “winning” feedback, displayed like award ribbons on a bulletin board by the entrance, Warren’s Blackboard has implemented less salt, more fish entrees, more vegetable appetizers and another dessert. Other suggestions looked like flame wars from a Crossfit message board: One guest suggested “Make more vegan friendly” while another “Less vegan friendly. More steak!” Not a challenge at all. The most popular dishes will likely be incorporated as the permanent Front Yard menu later this year, possibly with a price hike. If you’re interested in tasting the cooking, I’d go now. Travel writing. Filmmaking. Stray notes. This is the blog of LA-based film editor and writer Ben Caro. Read More. Cathedrals Update: That’s a Wrap! © 2010 —Benjamin Caro. All Rights Reserved. Powered by Wordpress.